What do you do when you see an ad in your Instagram feed? Whatever you do, the trend is clear – Facebook (who owns Instagram) is slowly but surely introducing more and more ads into your IG feed. Up until now, the ads have been few and far in between. I’d venture to say that you’re tagged in 10 spammy posts for every 1 ad you see (at least). Instagram is treading lightly with these ads since they know it takes an engaged audience for online advertising to work. Before we go any further, let’s clarify Facebook/Instagram’s position here: They want to make money. That’s it. By businesses, brands and advertisers spending money on their platform to reach an engaged audience, Instagram is winning on both sides – they’re making money and their users are happy. But while Instagram is money-driven, money is not the primary goal here – Instagram wants to keep its 200 million-plus users happy and engaged. That’s why it wants the ads and experience it delivers to its users to be the best they can be (it’s also why Facebook is on a quest to improve its users’ experience by cracking down on a lot of shady online advertising practices). So, that being said, this sounds like quite the pickle, eh? Instagram needs to provide a platform for businesses and brands to advertise, but also keep its user based happy & engaged – a user base who routinely bashes the slightest hint of an ad in their feed. And let’s be clear: Advertising is not available for all users just yet. To throw one more wrench in the plans: Instagram is the only social media with advertising capability that doesn’t allow for clickable hyperlinks in their posts. Meaning that there’s no direct way to measure the effectiveness or return on a specific post. You’re a business, brand or advertiser. As you’re uploading your post, one last step before publishing is targeting. You can target specific users with very small demographics (perhaps male-female, age ranges, & geographic areas). When you choose this specific targeting method, the only people who will see your post are those who fit the criteria of your targeting and are already your followers. I think that would be one of the best ways for businesses and brands to covertly advertise on the ‘gram and still keep up high user engagement. Obviously, a method like this would only be efficient for someone with, say, more than 5,000 followers, so that they would have a large pool of followers to target – so perhaps Instagram can only offer something like this to users with over 5,000 followers. 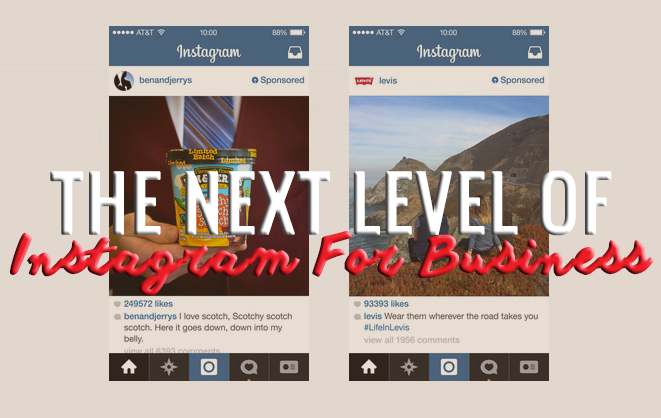 Just a thought…either way, I think the native advertising route will be a tremendous option on Instagram very soon. Instagram Direct has been a live feature since December 2013, but has largely gone unused for most businesses. For those not familiar, Instagram Direct is exactly what it sounds like – a way for someone to send direct pictures and videos to their followers. Just like point #1, I could see this being a viable native advertising option if businesses and brands with more than X amount of followers were given the ability to target all of their followers who fit a certain demographic. Obviously, there would have to be some very tight compliance rules around this, as people definitely don’t want their inbox filling up with spam, but I could see it being a tremendous platform where businesses could connect with a broad base of users directly. Disclaimer: These are merely my expert social media opinions on the future of paid media on Instagram and do not reflect actual developments. What do you think is the future of Instagram for business? Tell me in the comments below!